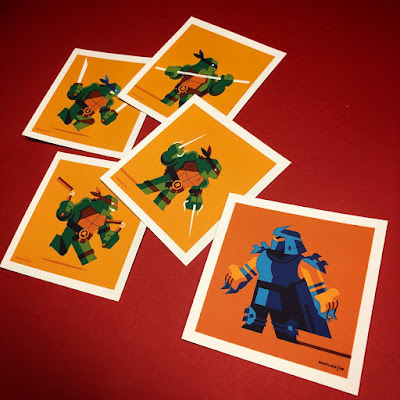 After the huge success of his 4x4 / Versus show at Gallery 1988 with Dave Perillo, Tom Whalen continues with the epic pop culture inspired 4”x4” screen prints with this awesome New York Comic Con 2018 Exclusive Teenage Mutant Ninja Turtles Set! This set of TMNT 4x4 screen prints includes Leonardo, Donatello, Michelangelo and Raphael and the evil Shredder. Limited to just 50 sets, this five print exclusive release can be purchased at Whalen’s NYCC booth #983 for $25.